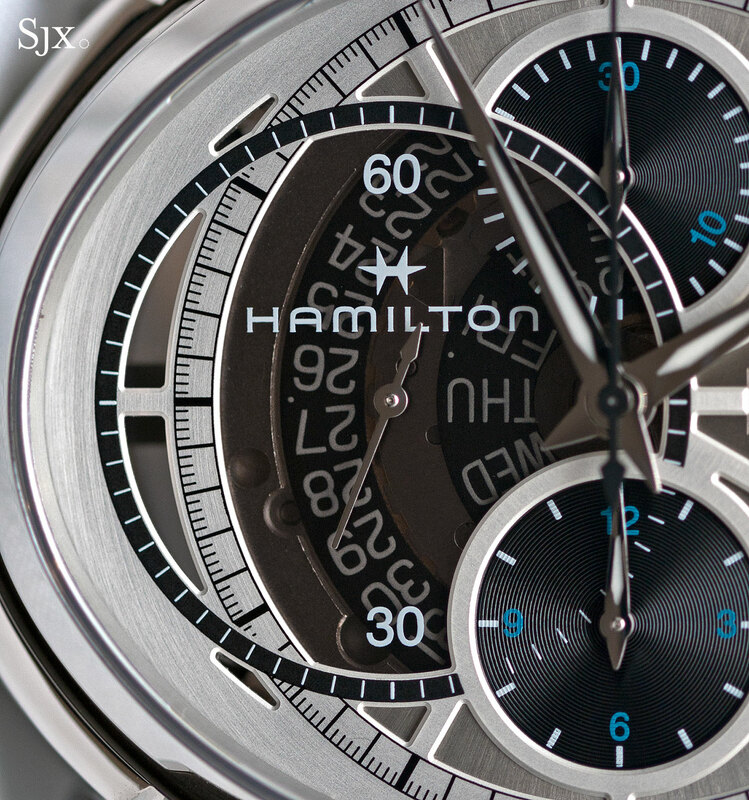 Though Hamilton typically makes simple and affordable timepieces, the Jazzmaster Face 2 Face II is anything but. The Face 2 Face II is a lot of watch for the money, both figuratively and literally. While the first instalment of the Face 2 Face was a watch with two standard movements, the Face 2 Face II is equipped with a novel, double-sided movement – and it is also priced more affordably. 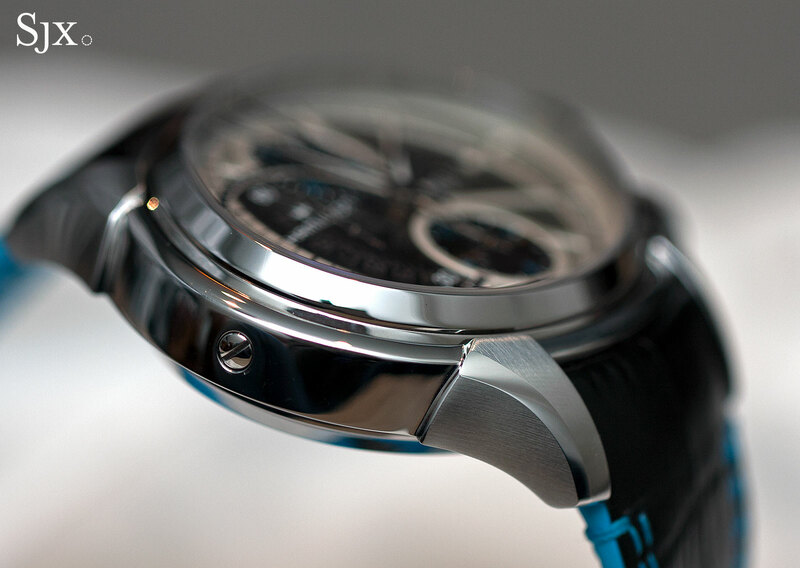 Physically the Face 2 Face II is enormous, with the stainless steel case 53mm wide. But because it is oval in shape, the case is not overly long, allowing it to fit even smaller wrists (though the strap is a challenge). Its size is a consequence of the reversible case: an inner case containing the movement is pivoted on the outer case at three and nine o’clock, allowing it to swivel vertically. 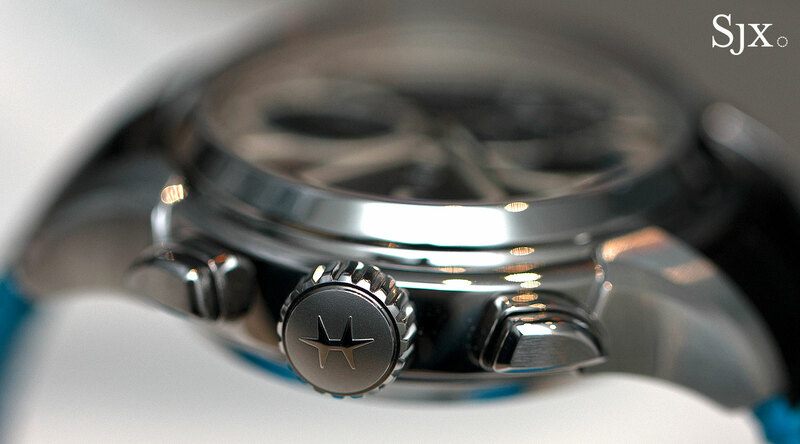 The swivelling case is to accommodate the double-faced chronograph. 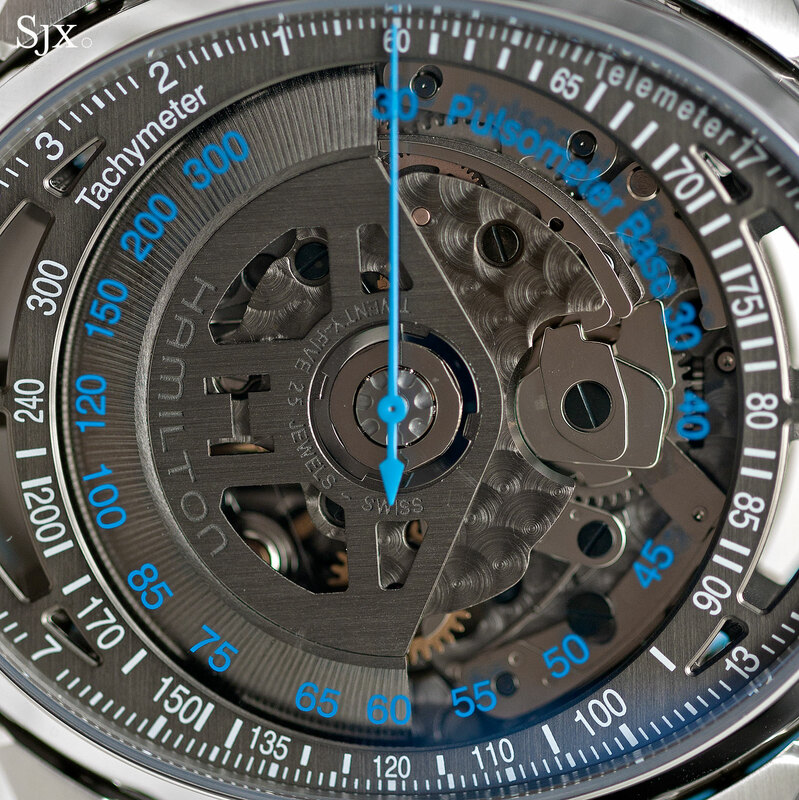 On the front the chronograph is a typical Valjoux 7750 layout, with sub-dials for elapsed minutes and hours as well as constant seconds. The reverse is where it gets interesting. 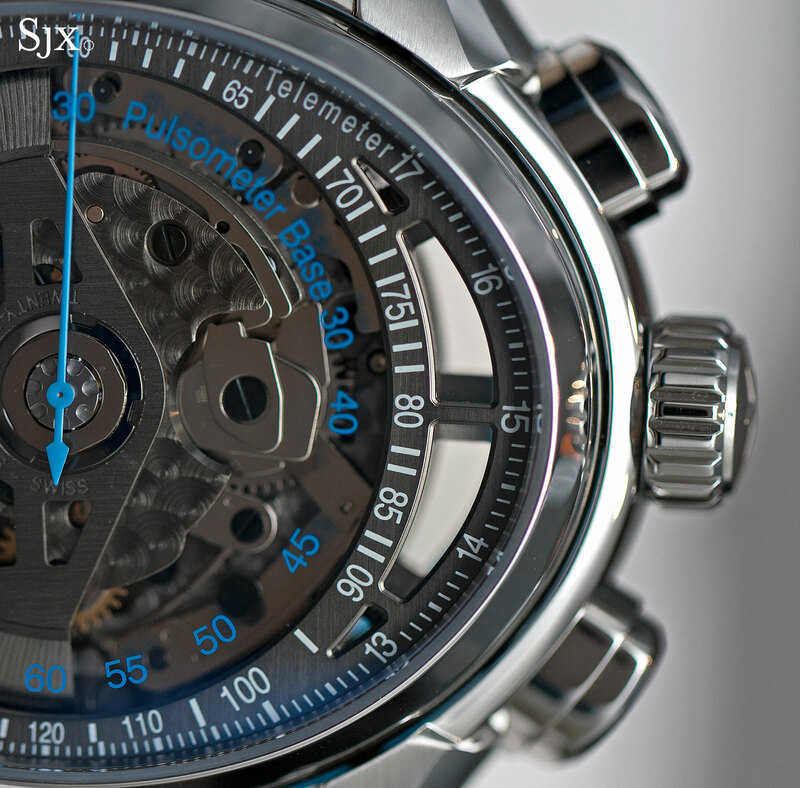 A central blue seconds hand is mounted on a pinion that shares the same axis as the winding rotor. 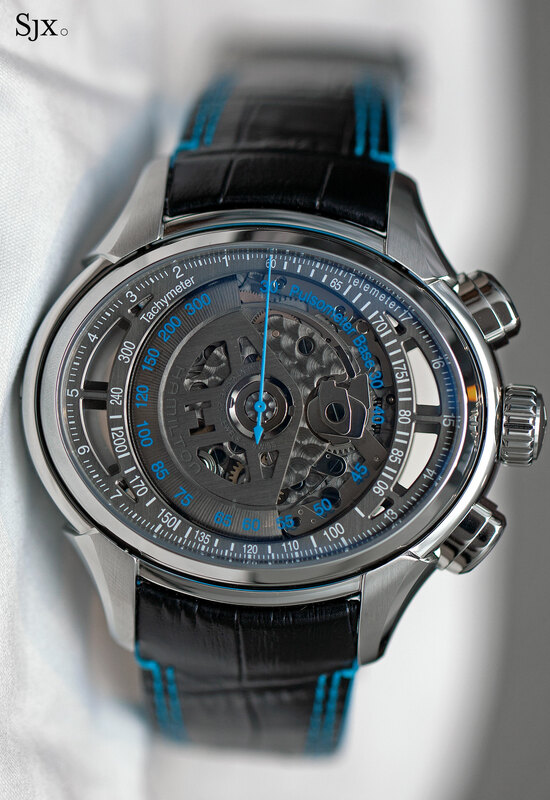 This seconds hand is connected to the centre seconds in front – a bit of extra gearing was needed to mirror the seconds on the back – and consequently travels anticlockwise when the chronograph is started. 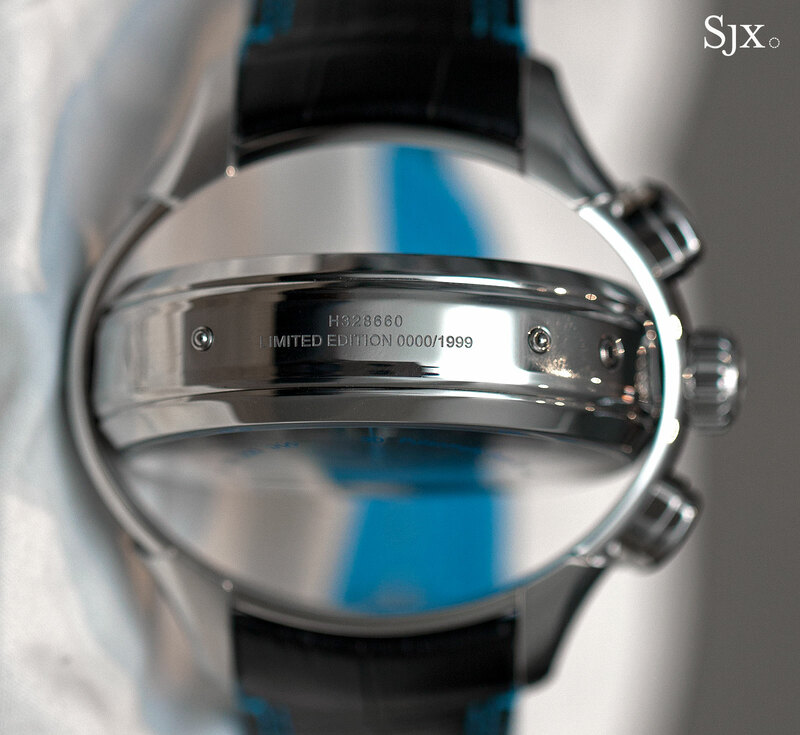 Three scales are printed on the sapphire crystal on the back – telemetric, tachymetric and pulsometric – allow for the measurement of distance, speed and pulse rate respectively. While the double-face chronograph wristwatch is not a new idea, Franck Muller pioneered the idea in the early 1990s (ironically with the same Valjoux 7750 movement), the Face 2 Face II is much more affordable than any other double-face chronograph to date. 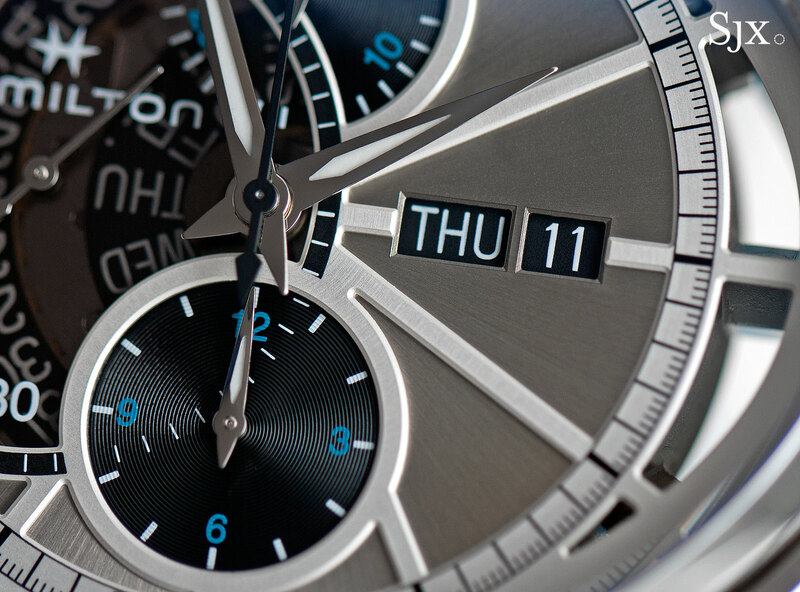 The movement inside Face 2 Face II is named the H-41, but it is actually a heavily modified Valjoux 7750 made exclusively for Hamilton by ETA (the largest movement maker in Switzerland that is conveniently Hamilton’s sister company in the Swatch Group). 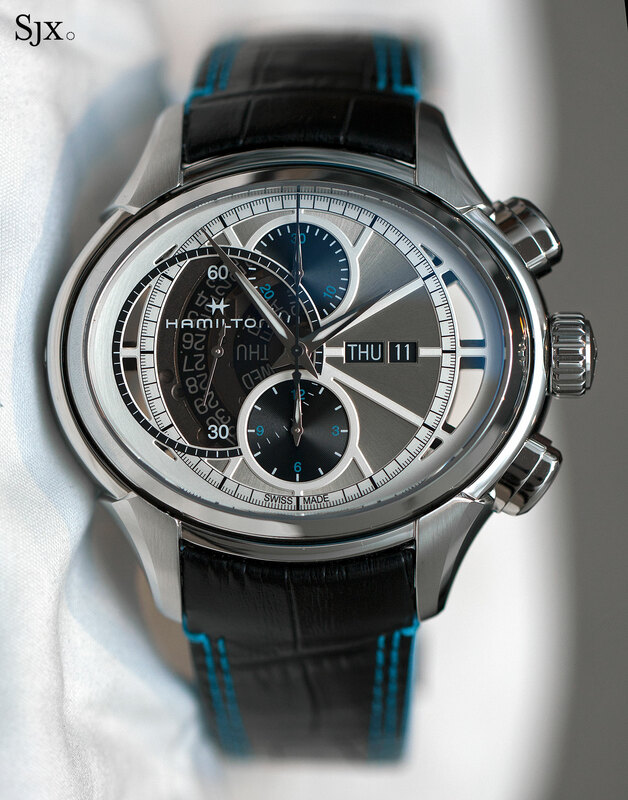 Besides the double-face chronograph display, the H-41 is also distinguished by the extended 60-hour power reserve, a quarter longer the the 48-hours of the stock 7750. While the finishing of the movement is basic and done by machine, it is attractively done with the bridges ruthenium-plated and finished with circular graining. The good detailing extends to the dial and chapter ring: the open-worked chapter ring on the rear has bevelled edges while the dial is multi-layered with a combination of finishes, frosting, straight graining and azurage (concentric rings on the sub-dials). The detailing on the case is also appealingly done, with enough alternating brushed and polished finishing to give it a look of quality. The lugs, for instance, are brushed on the top and sides, with a wide, polished bevel separating the two surfaces. Ditto for the chronograph pushers. Though Face 2 Face II is not as large as its dimensions would imply, it sits awkwardly on smaller wrists because of the stiff strap that integrates into the case. That is its biggest shortcoming, though a change of strap would allow it to wear better on all wrists. Limited to 1999 pieces, the Jazzmaster Face 2 Face II reaches Hamilton retailers in November 2016 and will be priced at SFr3895 or S$5730. That’s about US$3980.